You have been selected by the attorney(s) with whom you work to receive this first e-newsletter. If you would like to receive future newsletters from specific practice areas or if you would to like to make any other modifications to your subscription, please click here. Governor Andrew M. Cuomo modified New York's Alcoholic Beverage Control Law ("ABC Law"). On August 14, 2015, legislation was signed to modify three components of the ABC Law. New York State to contribute more than $16 Million to Grow New York's Craft Beverage Industry. On October 7, 2015, as he hosted the third Wine, Beer, Spirits, and Cider Summit, Governor Andrew M. Cuomo announced that the State will contribute more than $16 million in investments and initiatives to support the industry's continued growth. In many cases, New York snowbirds change their residency to Florida for many reasons, including because Florida does not have an estate or an income tax imposed on its residents. But, New York just does not like to let its residents go. Gov. Andrew Cuomo has signed into law a bill that has revised the current maintenance law in New York State. The portion of the statute that pertains to temporary maintenance will be effective October 26, 2015, and the portion of the statute referencing permanent maintenance will take effect on January 25, 2016. Often times, clients inquire as to why the litigation process is as lengthy as it is. The answer is not always a simple one. The time-frame within which an action is judicially resolved is a function of the court's caseload and the complexity of the matter being litigated. There are, however, avenues available to litigants in certain circumstances that will allow them to resolve their disputes more timely and in many cases more economically. 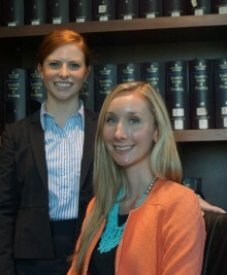 The Firm Welcomes Shannon O'Neill and Meghan McGrattan! We are pleased to announce that Shannon O'Neill and Meghan McGrattan have joined the law firm as Associates pending their admission to the New York State Bar. The Education Foundation for Suffolk County Extension, Inc. presents "The Good Earth Gala." This event benefits the educational programs and research of Cornell Cooperative Extension of Suffolk County. Scolaro, Fetter, Grizanti, McGough & King, P.C. is a proud sponsor of the event and Jeffrey M. Fetter serves as a member of the Committee. Click here to learn more about the November 5, 2015 event.